Learn to Sew: The Kid’s Edition! I taught you to sew, now it’s time to teach your kids! I’ve put together 5 sewing tutorials for kids that you can use to help your kids learn to sew. Complete with projects that are kid or teenager friendly for each week. 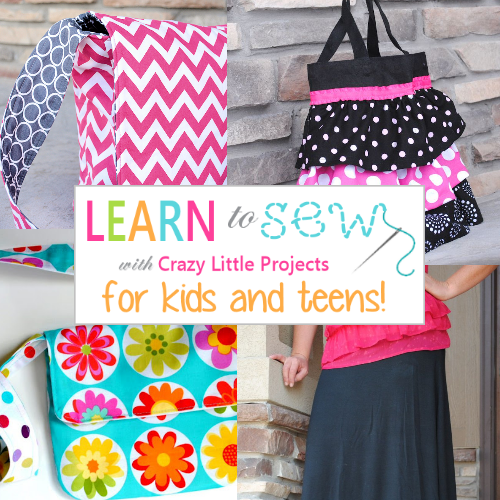 Think Learn to Sew Series meets Crazy Little *Kids* Projects. Moms, Grandmas, Aunts-I want you to sew along too! Obviously the kids can’t do this themselves. Work with your kids, grandkids, or whoever you want to sew with. Be part of this with them and have a great time! Didn’t do the Learn to Sew series the first time around? Now’s your big chance! Week 1-About 1/2 yard of cute fabric to cover a notebook. (You’ll probably won’t use all of the fabric.) You can also get embellishments like ribbon and coordinating fabrics. Week 2-About 1/3 yard each of 2 coordinating fabrics. This will be for a very small messenger bag. If you want to do a larger one, get 1 yard each of 2 coordinating fabrics plus about 1 yard of fusible fleece. Week 3-1 or 2 yards of fun pajama fabric (this will depend on how big you are-get 2 yards of fabric if you are doing this for a teen or older child) Also, you will need some elastic. Week 4: Tote bag that you can purchase at craft stores and 3 coordinating fabrics-about 1/4 yard each of them. 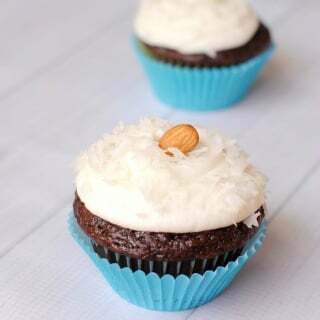 And ribbon to embellish it with. Week 5: About 1/4 yard each of 2 coordinating fabrics. 1 zipper that is 8 inches long. So How Do I Become Part of This? Just jump in and start now! Subscribe to the blog in several ways so that you will be sure not to miss any upcoming posts: Pinterest, Facebook, Email, Twitter, Google Plus. There is also a facebook group you can join to ask questions, post pictures and get to know other sewers. My daughter is looking forward to sewing more. She has already helped make 2 pillows, a skirt, a dress and PJ pants! I a going to do this summer series with my 12 year old self! I need to polish up my zipper skills. My granddaughter and I have a date every Wednesday starting June 12. We can’t wait for this. She has been learning and has made a few things, but this will definitely reinforce what she has learned and give her the opportunity to learn from someone else and give us some special time together. I take all of that special time with her I can get. Thanks for the series and for all your hard work. I have a sewing machine…but know very little about sewing. Excited for this series! My little one is too little to join me on this but I will definitely sew along. This is really a cute idea to help kids stay occupied during the summer. Thanks so much for offering this! This would be a great time for me and my daughter to spend quality time together this summer! What age do you think this is appropriate for? I know I started doing embroidery around age 5 or 6, but not sure about what age would be appropriate for involvement with a sewing machine! My girls are 6 and 8. Honestly I am not sure. If you think they are interested I would say give it a try and see how they do. If some of the lessons are too hard just take it at their pace. I’m so excited to do this with my teenagers this summer! Thanks for doing this – now my girls have something to look forward to during the summer weeks! I’ll be sewing along with my Daughter! The projects are so cute! Thank you for having this series. I am going to do this with my neice. And want to save all these for my grandchild. Thank you also for a chance at this giveaway.since I am a beginner I think I can also learn a thing or two from this series. My daughter will love this. She really wants to learn to sew. Thanks! My niece. She asks me all the time to sew. I can’t wait to teach her. This is awesome! I learned with you during the regular series, and am using my newfound skills all the time now! Can’t wait to share this with my daughter. This is great! My son (8) is taking a sewing class at Jo Ann’s Fabrics and making his very own shorts. Maybe he will be inspired by that experience and this new series! I hope my 8 year old daughter can do this with me this summer! LOVE IT! I am excited. My daughter loves to sew and these will be a fun thing to do on a hot day. My boys might even join in. My 4 year old son will love this! Thanks for the chance! FYI: Your “easy FB entry” options aren’t working right. OH poo. I misread that thinking it was sewing FOR kids and teens as in cute projects/clothing to make for my Granddaughter, not sewing WITH kids and teens. Hey, join us anyway! You can certainly do the lessons too! I’ve been working with my twin almost 10 year old daughters since last summer… This will be fun!! My seven year old daughter Skyler. Daddy just bought her and I our own sewing machines, so this would be fab for us to do together! Just got a sewing machine for my 7 yo granddaughter and have been looking for something like this. I want to do this with my girls. My daughter has been begging me to teach her to sew for a long time…this is the perfect opportunity! I’m also going to teach my boys! What a great idea. Just pinned! My daughter is six and really wants to learn to sew. When she was 4 she asked for a sewing machine for Christmas. She got one but has not used it much. We will join in. 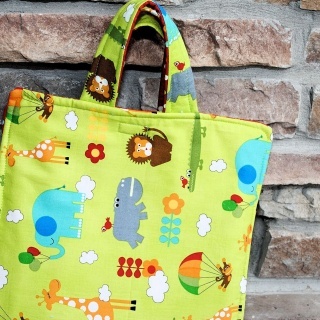 I really want to use it with my stepson and stepdaughter, my daugher is only 2 but she loves the sewing machine already! So, we might try it as a whole kid-family activity. Some proyects might be more girly than others so it works out perfect! just what i needed for my girls this summer! My nine year-old daughter has been bugging me to give her sewing lessons this summer – your series will be perfect for this and I can’t wait! This should be fun! I just learned how to use my sewing machine a few months ago and can’t wait to learn more about how to use it! I am going to do this with my 8 year old daughter!! I really want to make a messenger bag! My 13 year old daughter has been begging me to teach her to sew, this is the help I need THANKS! This is perfect for myself! Only hoping my sewing machine works properly. My 5 and 6 yr old sons are eager to learn – helped them each make a simple drawstring bag recently – 6 yr old did most of it all by himself! My daughter has been wanting to learn how to sew for some time now, so this will be fun for us to do together! My daughter has been begging me to teach her to sew, this will be a perfect way to do it. Thanks! My daughter has been asking to learn to sew. This will be a great way to teach her! Excited! We got a new sewing machine so, I am going to follow along and refresh my sewing skills and as soon as my daughter comes back home from going out of state to visit her dad we will do them together. My two boys (ages 9 & 7) and maybe my daughter (age 4). I am going to be doing it by myself, because i am a teenager!! Sharing this with a girl friend of mine who has all girls and they want to sew. I would love to do this with them. I’m TOTALLY doing this!! A has wanted me to teach her to sew for a couple of years, but not knowing much, I didn’t know how to teach her! This will be perfect for us to do this summer. YAY!! What a great idea! I’ve been thinking for longer times to show our son how to sew. We will join in. I’m so excited! My ten year old daughter and I are in! I’m going to do the learn to sew with kids class with my 10 year old daughter. She is very excited about learning to sew and I LOVE that we can do this together at home. Thanks for providing the opportunity for us to do this together! my girls are going to LOVE this! I am going to do this with my 7 year old daughter. She has been begging to learn to sew yet is very independent. This sounds perfect! my daughter got a sewing machine for her birthday, so we’re going to learn to sew together! Thanks for a fun giveaway! I am doing the series this summer myself along with my daughter Catelyn she is 12. I learned very little in Home Ec and my mom never understood the tension on her machine so my sister and I were never allowed to use it. My husband bought me a nice machine (Brother) this year with our tax return, I’m excited to learn and even more excited that my daughter and I can learn together! I am so going to have my daughter follow along this summer. Also, when I try to follow you on pinterest I get an error. Is the link wrong? I plan to do this with both my daughters. I am very excited. I need to learn how to do these also. My son and I are doing this new series for kids! I hope there will also be another one at some point with more boy friendly projects. Thanks for offering this class! You know what?! I hadn’t really even considered the boy factor. But the good news is that really, the only project that wouldn’t be boy friendly are the ruffles…which would be boy friendly in general due to ruffles, so this should work out fine! I have wanted to learn to sew and now that my daughters want to learn it is time for us all to embark on a summer adventure! Here’s to hoping I can figure out my husband’s grandmother’s ancient sewing machine! My niece and I will tackle this together!! Always enjoy your posts, I look forward to the emails to see what fun projects you are doing. Hoping to do this with my older son, but he might not be old enough. We will take it slow and see how it goes. My girls will be so excited with this tutorial! We are very excited about this!! My daughter got a sewing machine for her birthday & has been itching to do more with it!! I plan on doing this fun series of crafting with my two little ladies and their friends. So or should I say “sew” excited!!!!! i can’t wait for my two daughters to do this. they are really excited to get started. I am so excited that my friend posted this. I am going to do this with my two daughters (6 & 8) and my neighbors little girl who is 9. So much fun. Thank you so much for doing this. I have to tell you I am using this for my son’s sewing portion of his 6th grade home economics class. You did a fantastic job and have fun projects; many he can use as gifts for family and friends when Christmas comes. The ruffled apron he will make for his little sister, make up bags for grandmas, PJ pants for cousins, and something for himself too. I may have him post when he is done, if I can remember, to let you know how it goes. I would that I had found this earlier… I am home schooling and was hoping to include sewing as part of her program… is there anyway to get the lessons? Of course!! They are all still there. Just run a search for the learn to sew kids lessons or click to learn to sew tab on the menu bar and that will take you to the original 7 lessons. I’ll work on putting together easy access to the kids ones too. My granddaughter, Elisa and I are going to participate in your crazy lesson. I have a question on the week 2 lesson. Would laminated fabric be appropriate for making the messenger bag? Sure!! I think it would work just great. Did you have a link for the sewing license? I thought I saw it and now I can’t find it. Not sure what you mean by sewing license? The Kids Edition! <Liked it! Amber, My right year old daughter decided to do the kids learn to see series after she took a beginner class at the local craft store. I love is you explain it and I love the little project ideas. We have have done something wrong on our mini messenger bag though because the flap doesn’t lay flat over the straps. She wants make another one though so maybe we can do better the next time around. Try folding the straps where you insert them. hi im new to your bolg really hope you do another one becusae im 11 years old and really want to learn to sew.